TH: Take I-5 north to Merlin (Exit 61); drive thru Merlin and follow Galice Road 19 miles to the far side of the Grave Creek bridge; turn left downhill to boat ramp and TH; EDT: 90 minutes. Description: Follow north rim of Rogue River canyon past Rainie Falls to Alder Creek and back; spectacular scenery, but trail is a little rough in places. You may find poles useful on this hike for both the occasional side stream crossings as well as the rocky up and down trail. Distance: 10 miles; About 2,500' of up on this one; lots of little ups and downs that add up to a good workout. Weather forecast. RT mileage: 150 miles. TH: Take the first Mt. Shasta Exit (740). East on Mt. Shasta Boulevard for about 3/4 mile to the first left and then a quick right on Ski Village Drive over to Everitt Memorial Highway. Left on Everitt for 1.6 miles to a left at the Black Butte Trail sign. From there, basically follow the best road at each intersection which is 41N18 (for a map to the TH click HERE). From the turn off of Everitt go 400' to a right. Continue 1 mile to a left for 0.4 miles to a right for 0.9 miles to a final left for 1 mile to the TH. EDT: 90 minutes. Description: switchback your way to the top for spectacular views all the way from the Sacramento Valley to Oregon including Mt. Shasta, Mt. Eddy, Mt. Lassen, Castle Crags, Mt. McLoughlin and the Klamath range. 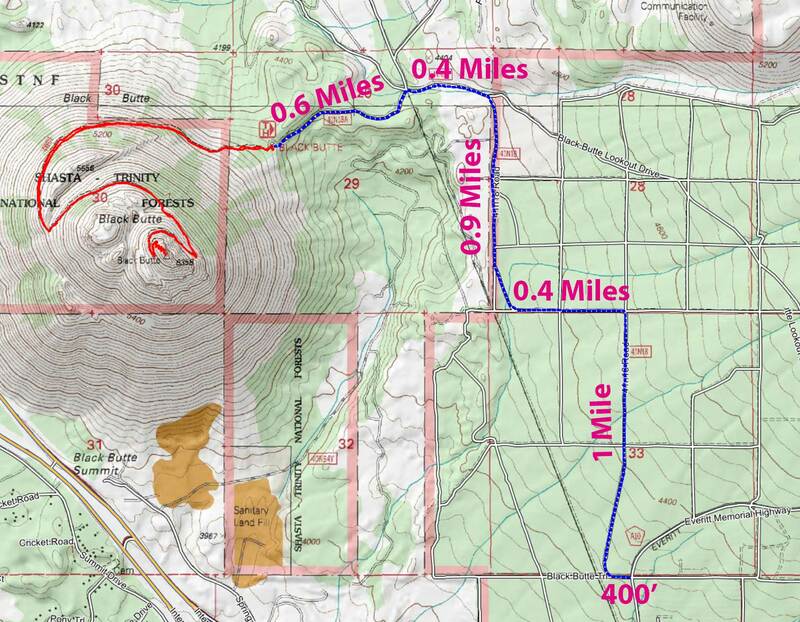 Distance: 5.2 miles RT; 1,925 feet of climbing. Weather Forecast. RT mileage 160 miles.